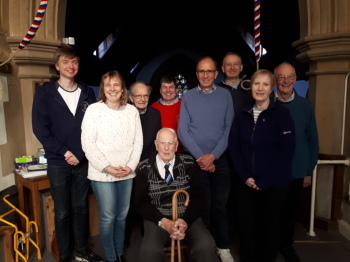 Rung as a compliment to George E Coldman, longstanding ringer at this tower, celebrating his 97th birthday on 14 April. The band, clockwise from front right (sort of), with George. First submitted Saturday, 13 April 2019 at 17:52:49 by Matthew S Pearson.